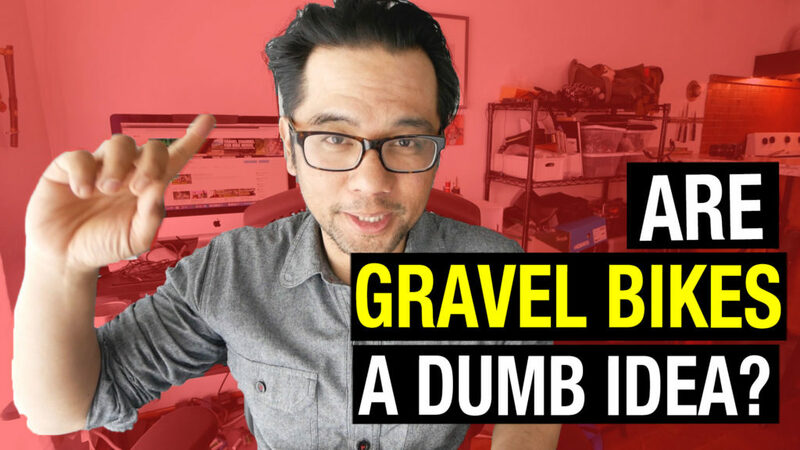 Home > Video > Gravel Bikes Are DUMB?!? A bit of rant addressing comments we usually get around the “gravel” bike. I don’t think gravel bikes are a dumb idea. I suspect what people are actually saying is gravel bikes or perhaps more correctly, gravel bike geometry, isn’t as new as the marketers would like to lead us to believe. As an example my 2009 Marin Muir Woods 29er (marketed as an Urban Bike) has clearance for 2″ tires, rack braze ons front and back, the head tube angle, seat tube angle, fork offset and BB drop are identical to the Salsa Warbird in a similar size. I could put drop bars on my Marin, different stem, swap out some other components and say “there, it’s a gravel bike”. Not to say there aren’t plenty of differences between the two but there are also plenty of differences between the Warbird and the Journeyman. It often seems the main difference is the way the frames are built up and the way the end product is marketed. Maybe it’s just a difference of perception. Some of us look more at the similarities and some of us look more at the differences. I’m from England, I had a gravel bike at the age of 7 I’m now 64. The bike in question was purchased from the local army and navy store cost about £3.00 three pounds Lsd. We took them over our local farm tracks and up to our local beauty spot (Cannock Chase). Frame was steel, wheels about 1 and 3/4 rims big tyres, the wheel’s where made from steel also the hubs. Single gear as well. HAD FUN on them!! !